“Golf came and went in Melbourne in the 1840s,” wrote Sir Peter Allen in The Sunley Book of Royal Golf; “the Club such as it was ending with a dinner at the Royal Oak Hotel in 1850. After that the discovery of gold in New South Wales and Victoria caused a huge boom and influx of people, followed by slump, which put aside most frivolous activities, so that organised golf was not revived in Melbourne until 1891. The Melbourne Golf Club which was formed that year subsequently divided into two, one of which today is the Royal Melbourne Golf Club and the other the Metropolitan Golf Club. 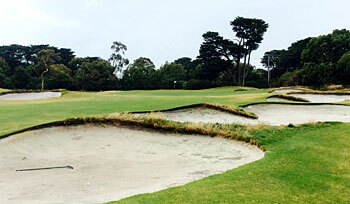 The following passage is a brief edited extract from The Finest Golf Courses of Asia and Australasia by James Spence. Reproduced with kind permission. "Although six holes from the East course are incorporated with twelve from the West when Royal Melbourne is presented in its championship livery, when played in its entirety as the playing style of the East course is distinctly different. The bunkers are not so cavernous as to diminish the golfer. The fairways, though generous when compared to the Sandbelt average, are not as wide as on the West. While it does not quite offer the grand theatre of the West, it is still a fantastic golfing experience and holds its own versus all other courses in the Melbourne area. It is with the par threes I think where Alex Russell and Mick Morcom’s design most closely approximate their Svengali. All bar the short 13th make use of some natural drama. All involved some carry over the sandy heathland. As the greens are large enough to permit multiple pin permutations and you find yourself poised over your bag in between two or even three club decisions." "I first came to Melbourne in February 1977 and played Royal Melbourne’s West and East courses (as well as the Composite Course) on that trip. I have been back to Australia at least twice since and played RMGC’s West course at least three more times, but had not replayed the East. I clearly remembered holes 1-3 and 17-18, but to be honest not much about holes 4-15 (except remembering that it was almost as good as the West). So this time I decided that it was time to revisit the East and was very glad I did. It is an outstanding course and its only fault is that it sits in the shadow of RMGC’s West (which a good number of knowledgeable observers consider to be the finest in the world)." Royal Melbourne's East course is always going to live in the shadow of it's big brother the West course, there are great holes here in my opinion, mostly at the beginning and end of the round. Course was is good shape when I played there, greens running very true like you would expect them to on the sandbelt. Shot values score well here as do all the sandbelt course, the contours of this course are still of a very high standard. The resistance to scoring here at the east course is indeed fair and not to difficult, the fairways are wide enough, bunkers are in good condition to hit out of. Not that much elevation change at the east course but the routing is strong. The memorability at the east course is high as well, with great bunkering and green complexes meeting the golfer. Overall I enjoyed my day here immensely !!!!!!!! The East course has recently reached the top 100 world rankings on its own merits and I can see why. It's a great collection of holes. The par three 13th on the East, 135 meters, which doesn't play in the composite courses is a spectacular little par three. It has the best protected green of the 36 holes at Royal Melbourne. The third hole on the East is a dogleg right down a sweeping hill and the fourth is an interesting uphill par three. The second on the East is a great par four that has a blind tee shot to a fairway that starts far left and comes back to the right. The composite course at Royal Melbourne was devised for tournaments in 1959 so that crowds would not have to cross Cheltenham Road. While it can be confusing playing the courses trying to figure out which holes are part of the composite, the easy rule of thumb is that if you are still on the side of Cheltenham Road near the clubhouse, you are on the composite. The holes from the East course (1,2,3,4, 17 and 18) that are part of the composite are a worthy bunch. I have never played the west course, so this is all I have to go on, but Victoria is a better track. The holes at RM East you start and finish, 1 to 4 and 16 to 18 are simply superb and amongst the best collection of short par fours, two classic threes and possibly the best finishing hole in Australia. All of them have been part of the composite course and six currently are. However, once you cross the road the course becomes a little flat and mundane, albeit well designed, excellent condition but not inspirational. That was a bit of a letdown. especially after the first four holes. Perhaps it was just that I had such high expectations, but I felt I would have been happy to play those 7 holes three times rather than the whole 18. Played here on a reciprocal arrangement with my home golf club, Ganton. Was originally due to play the west but due to a comp played the east instead. Was originally disappointed but was still happy to play the east instead.The welcome I received at the pro shop was first class and made me feel very welcome. The rental clubs were top quality too (no excuses there either).I was put with three members who also made me feel very welcome, and calmed the nerves some what. The east course starts brilliantly, the opening four holes are really superb. I thought the quality of the presentation of the fairways and greens was first rate too. The fairways were in fantastic nick and the greens really fast. It Took me a long time to get used to them!I enjoyed the whole course and the experience too. If I had one criticism it would be that I would have like more sand in the bunkers. They were a little hard and I really struggled with them. The club house is welcoming as are the members. I shall remember the experience for a long long time. Thank you to RMCG for making me so welcome. I look forward to being able to reciprocate. Not bad. Not RM West that's for sure and I am not really sure this is a Top 100 world course either having been lucky enough to play a number, especially in the US. The composite course holes are great. The 1st is a great way to start and 2 3 and 4 really test you as you go through a long uphill Par 4, short dog leg Par4 then long uphill Par 3. Wolds class opeing set of holes. Then once you cross the road it falls away quickly I think (and gets flat - too flat) other than the odd gem (like the Par 3 6th, Par 3 13th and absolutly wonderful short Par 4 15th). Crossing 3 sets of roads to get back to the main RM piece of land takes away from the experience. 17 and 18 are then a world class massive Par 5 and long Par 4 coming home (closing holes of the composite course). There are plenty of courses in Australia that don't get rated highly for whatever reason that are a better set of 18 holes. I am a member of Royal Melbourne and I find this a very fair review. I might give it 5 not 4 golf balls but not the 6 that the West deserves. Might I say that I am always happy to play this lovely course, and I think most members feel the same way. We shall all have the opportunity of seeing the Composite course televised in November 2011 when we host the President's Cup. Could you tell some of the courses that are a better set of 18 holes? I can only think of the West, Kingston Heath, Royal Adelaide, NSW and arguably The National Moonah, Metropolitan and Victoria. I am happy to be corrected if there are others. There’s a parallel between Royal Melbourne and Wentworth. Both clubs have two courses named West and East (all four courses were laid out around the same time) and both clubs claim their best course is their West course. I personally agree both Wests are best but the best of the lot is the West course in Melbourne by some distance. The East course at Melbourne, like the East course at Wentworth, is shorter but that doesn’t mean to say it’s easier than the West. Getting to the greens may be easy enough but getting off them again with a couple of putts is a different matter. I’ve been lucky enough to play most of the courses on the fabulous Melbourne sandbelt and the East is one of the best but Kingston Heath is in a class all of its own, just like Sunningdale.